The presence of abdominal injuries has a major impact on the mortality of severely injured patients. For injuries that require surgery, laparotomy is still the gold standard for early surgical care; however, there is increasing evidence that laparoscopy may be an alternative in the early clinical care of polytrauma patients. The present registry-based study analyzed the utilization and the outcome of laparoscopy in severely injured patients with abdominal trauma in Germany. A retrospective analysis of 12,447 patients retrieved from the TraumaRegister DGU® (TR-DGU) was performed. The primary inclusion criteria were an injury severity score (ISS) ≥ 9 and an abbreviated injury scale (AIS) [abdomen] ≥ 1. The included patients were grouped according to early treatment management: (1) laparoscopy, (2) laparotomy and (3) non-operative management (NOM). Finally, group-specific patient characteristics and outcome were analyzed. The majority of patients were treated by NOM (52.4%, n = 6069), followed by laparotomy (50,6%, n = 6295) and laparoscopy (0.7%, n = 83). The majority of laparoscopies were performed in patients with an AIS [abdomen] ≤ 3 (86.7%). The ISS of the laparoscopy group was significantly lower compared to that of the laparotomy and NOM groups (ISS 23.4 vs. 34.5 vs. 28.2, respectively, p ≤ 0.001). The standardized mortality rate (SMR), defined as the ratio between observed and expected mortality, was lowest in the patients receiving laparoscopy followed by laparotomy and NOM (SMR 0.688 vs. 0.931 vs. 0.932, respectively, p-value = 0.2128) without achieving statistical significance. Despite being rarely employed the data indicate the effectiveness of laparoscopy for the early treatment of severely injured, hemodynamically stable patients with an AIS [abdomen] ≤ 3. 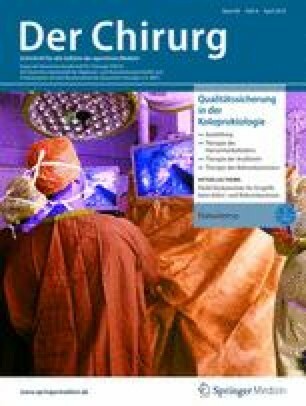 F. Debus, R. Lefering, P. Lechler, S. Ruchholtz, M. Frink und TraumaRegisterDGU® geben an, dass kein Interessenkonflikt besteht.